NEW YORK, New York, November 7, 2012 (ENS) – A new weather emergency is bearing down on the New York-New Jersey region, just nine days after superstorm Sandy walloped the East Coast, leaving millions without power and displacing thousands from ruined homes. The National Weather Service warns that a low pressure system off the Mid-Atlantic coast will strengthen as it moves north on Wednesday, bringing rain, snow, and/or a mixture of precipitation to areas across the northern Mid-Atlantic and Northeast, as well as wind gusts as high as 60 miles per hour along the coast. Snowfall across interior sections of New England could approach six to 12 inches. Coastal flooding is also possible during the storm, known as a Nor’easter, meaning that it is blowing in from the northeast. This type of storm has characteristics similar to a hurricane. Weather forecasters say the greatest impacts of the coming nor’easter will be from New Jersey to Cape Cod, where coastal flood warnings and high wind warnings are in effect. According to Accuweather forecasters, this nor’easter will bring a water rise of three to four feet above tide level to some areas. Hurricane Sandy damaged or destroyed a lot of the dunes that were in place to protect beach communities from coastal flooding. Now water can surge directly over the New Jersey coast. AccuWeather.com meteorologist Michael Piggott says one of the best indications of a storm’s strength is the barometric pressure. “Since the nor’easter’s pressure will not be as deep, its winds will not be as strong, nor will there be as much rain and snow,” he said. Despite the fact that this storm will not as strong, it can still add on to the problems many in the Northeast are already facing. Heavy, wet snow may cause tree branches to snap and knock out power lines. Areas in Maine and New Hampshire are expected to get up to a quarter of an inch of ice that could also lead to power outages. New York Mayor Michael Bloomberg, who evacuated low-lying areas of all five boroughs during Sandy, today told reporters that he has not ordered another evacuation. To protect the health and safety of residents and staff, New York city and state officials Tuesday did issue evacuation orders for four health care facilities in the low-lying Rockaways section of Brooklyn. These four facilities, housing 625 residents, are in the area of the Rockaways most heavily impacted by Sandy and have been operating on generator power. But a nor’easter storm surge could compromise their generators, putting the elderly residents at risk in the cold and dark, and requiring an evacuation under those conditions. Power to New York City is gradually being restored, although the mayor said 66,000 electricity customers are still without power. About two-thirds of those are customers whose wiring system panels were flooded with salt water. These panels must be cleaned or else applying power to them could start a fire. So, even if the utility has restored power to a street, unless they can get into a house to inspect and repair, so they have to cut that house or business off from the system so that others on the street can have their power restored. 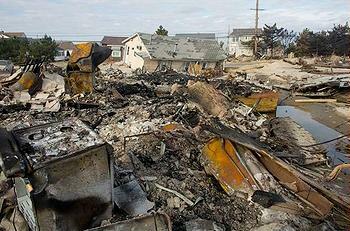 There are 40 teams of licensed electricians and plumbers going door-to-door in the hardest hit areas of Staten Island and the Rockaways to inspect and fix these damaged wiring systems, Mayor Bloomberg said. Electricity and heat are being restored to public housing residents, but the mayor said there are still 17 percent without electricity and 30 percent without heat and hot water. 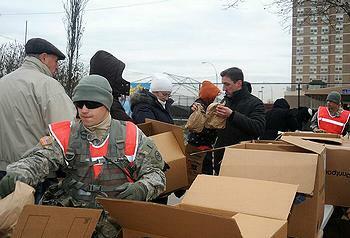 Food and water provided by the Federal Emergency Management Agency and others are being distributed by the U.S. Army National Guard throughout the five boroughs. Today, public school students were back in class at 1,728 New York City schools, a larger number than were open on Monday. 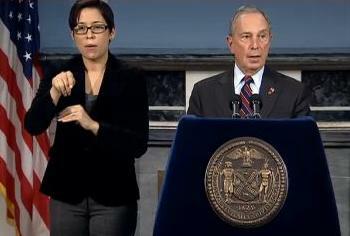 In Mayor Bloomberg’s view, global climate change is a factor in the severe weather his city is coping with. Could New York build a barrier to keep out the storm surge as European cities such as London have done? Mayor Bloomberg doesn’t think so. Mayor Bloomberg today announced that more than $32 million has been raised to date by the Mayor’s Fund to Advance New York City for the City’s emergency response needs and long-term restoration efforts from more than 10,000 donors from around the country. One hundred percent of all donations will be dispersed to support relief efforts and organizations, as the Mayor’s Fund does not retain an administrative fee. Donations are being used to address the most immediate needs in hurricane affected neighborhoods, including water, hot food, toiletries, baby supplies, warm clothing and blankets, cleaning materials and other supplies. The funds raised will also address long-term needs, including housing and other efforts re-build and restore neighborhoods and communities affected by Hurricane Sandy. Mayor Bloomberg and Airbnb today announced the launch of a new platform to help connect victims of Hurricane Sandy with free housing options. Airbnb, a social website that connects people who have space to spare with those who are looking for a place to stay, is now providing a platform to connect those who are eager to offer free housing to those who have been displaced by the storm. The process will be free of charge, but Airbnb will still provide customer service, insurance for hosts and other services. New Yorkers can now list their homes and extra space easily and immediately, and people who are looking for a place to stay can access these free spaces via Airbnb’s Donated Sandy Housing Directory at https://www.airbnb.com/sandy.